Fr. John Whiteford's Commentary and Reflections: What does this inscription mean? What does this inscription mean? 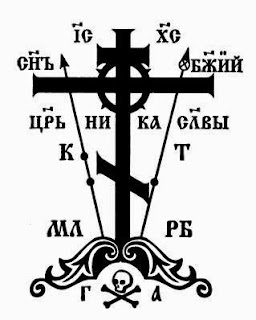 Of course most Orthodox people know, IC XC NIKA means "Jesus Christ Conquers". Sin Bozhie = Son of God. Tsar Slavie = King of Glory. 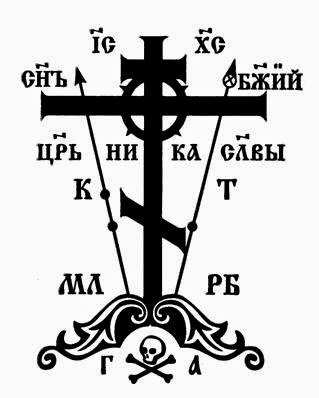 K T = Kopie and Trost, which means "Spear and Reed"
M L R B = Mesto Lobnoye Raj Byst', which means "The place of the skull became paradise." G A = Golova Adam, which means "The Head (or Skull) of Adam".